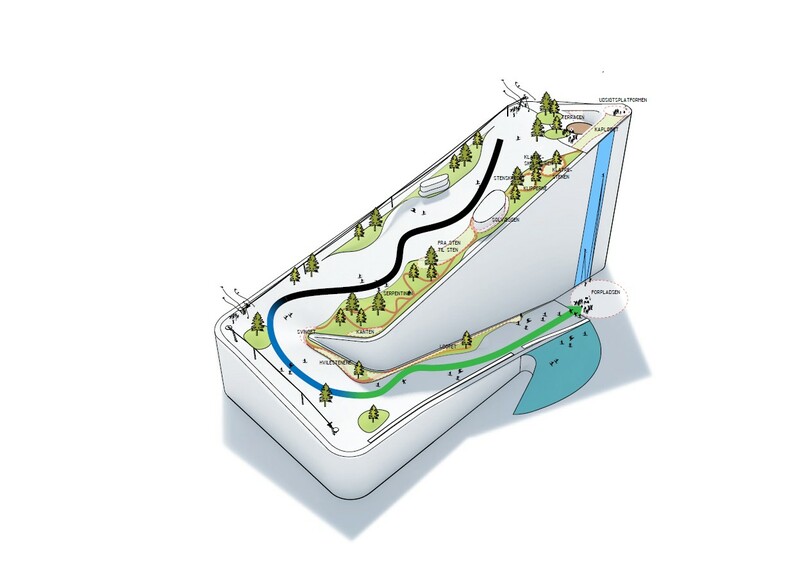 Copenhagen, Denmark – When Copenhagen’s new waste-to-energy plant opens next year, the city’s residents will have a new ski run to sample, too. The new Copenhill / Amager Bakke power plant currently under construction will not only be one of Europe’s most energy-efficient, environmentally friendly and highest capacity waste-to-energy plants, but also it’s most visually attractive and publicly acceptable, according to builder Babcock & Wilcox Vølund. 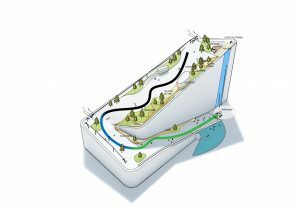 A ski slope, over a quarter mile long, will drop nearly 300 vertical feet in a circuitous route from the roof’s highest point. Uplift will be provided by surface lifts and elevators within the power plant. Runs will range from beginner routes to 45% slopes for experts. Right now, there is a single ski area in Denmark, located outside of Copenhagen and open only in those rare instances that the area is draped in snow. They’re also trying to figure out how to make the power plant belch smoke rings. Keep in mind that this level of ingenuity, courtesy of Danish architects Bjarke Ingels Group (BIG), comes from the same country that brought you Lego. The biggest challenge currently faced is figuring out how to keep skiers from sliding off the edge of the roof. At the moment, the best idea they’ve come up with is an array of safety nets. For those who are not skiing, designers will be established green areas that can be used to walk, run or enjoy other mountain activities. Climbing routes will be established along parts of the building’s facade, and visitors will be able to enjoy a cup of coffee and unique views of the city and the Øresund connecting the Baltic Sea to the Atlantic Ocean, from the top of the plant.